The term ‘allergy’ is used to describe the body’s immune response when it detects a particular substance in the body. The substance may not necessarily be harmful (hayfever is a response to pollen for example ) but the body detects it as foreign and sets about an immune response in reaction to it. This reaction causes varying symptoms and disease in a predisposed people. Allergy is widespread and affects approximately one in four of the population in the UK at some time in their lives. Each year the number of people suffering from allergies increases by 5%, and as many as half of those affected are children. 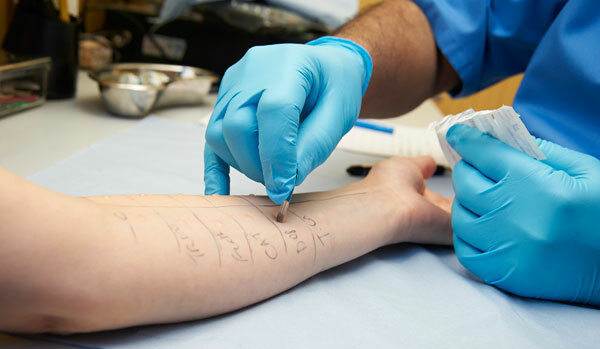 Most allergies can be successfully diagnosed and treated by GPs. The Trust provides a service for problematic patients, where the diagnosis may not be clear, or when more specialised treatment is required. Visit our Allergy and Immunology website for more information and details on how to contact us. If you would like to receive specialist advice where you feel a referral to an outpatient appointment could be avoided, we provide this through the national Choose and Book system. This is the most secure and convenient way to contact our Consultants. The link to the Choose and Book application is https://nww.ebs.ncrs.nhs.uk (requires Internet Explorer version 6 or above). We aim to respond within 5 working days but often exceed this. Read Page 10 of this document http://www.chooseandbook.nhs.uk/staff/communications/fact/adviceandguidance.pdf to explain in more detail how to request advice through Choose and Book.